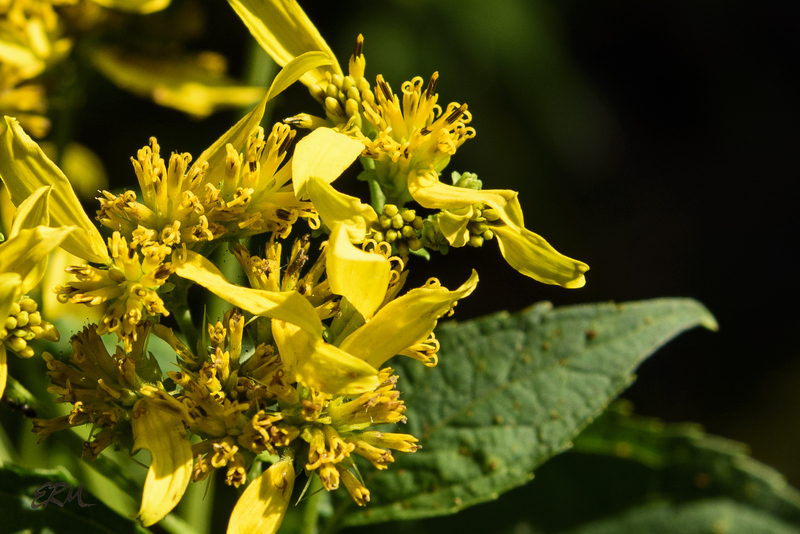 Lining the highways this time of year are lots of tall white-flowering and yellow-flowering forbs. 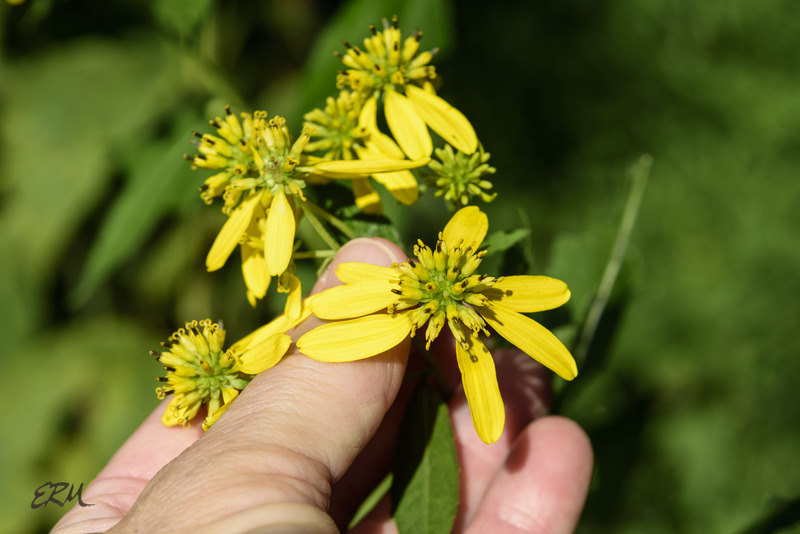 Various species of goldenrod are among the latter, and so are two other members of the Asteraceae: wingstem and yellow crownbeard, the only species of Verbesina present in Maryland (probably). At first glance (or at 60 miles per hour), the two look a lot alike. 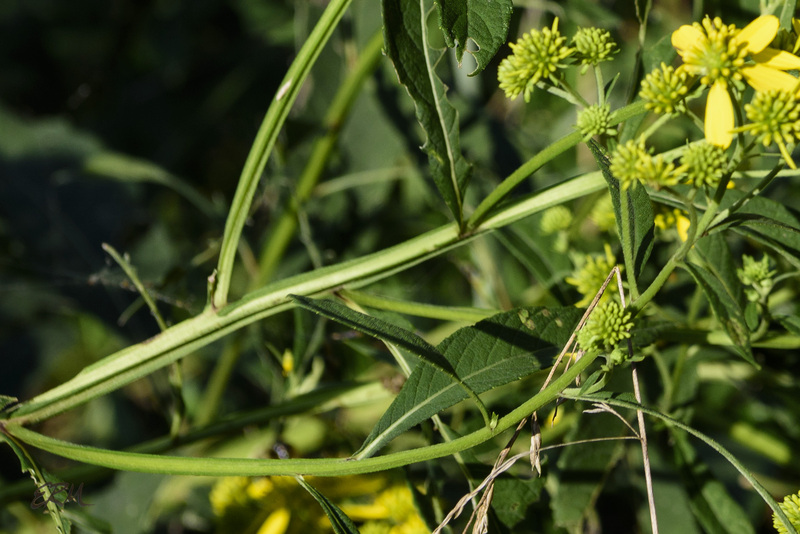 Each can get quite tall, up to two meters, and each has large leaves, thick-looking stems, and dense arrays of composite flowers. 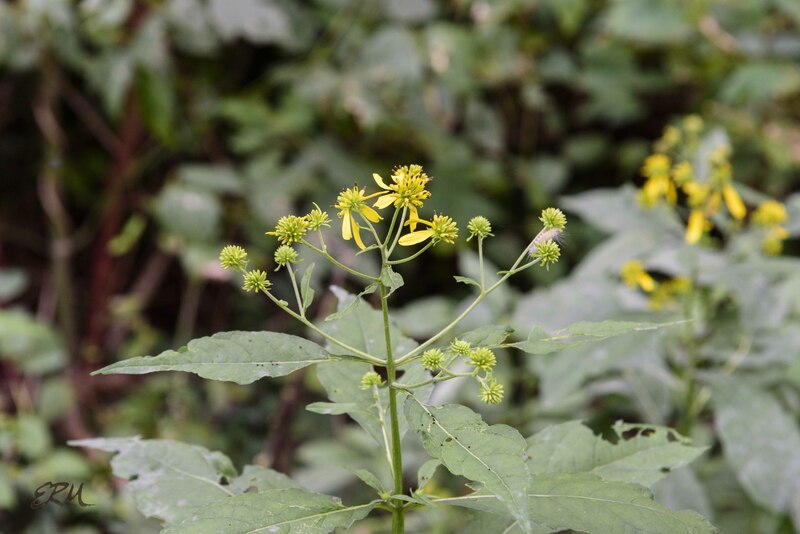 Overall form: tall plants, multi-branched, with thick stems, topped with yellow flowers. 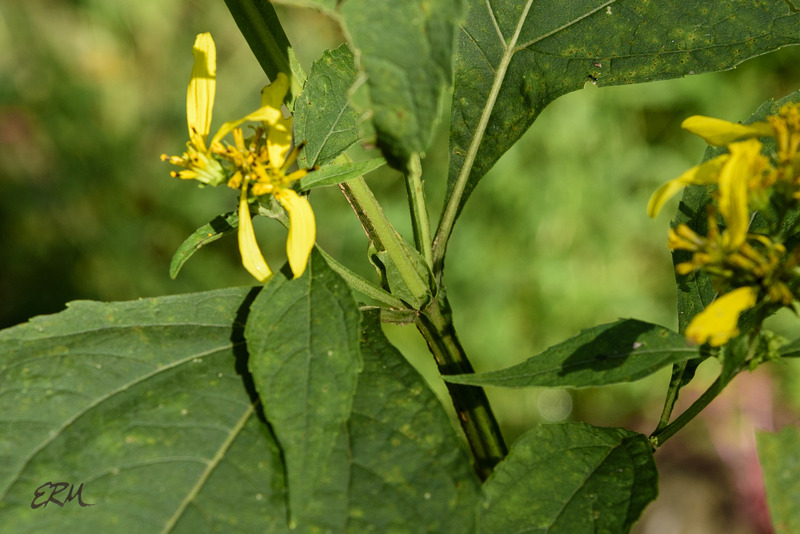 Both have leaf-like tissue running along the stems (hence “wingstem”). 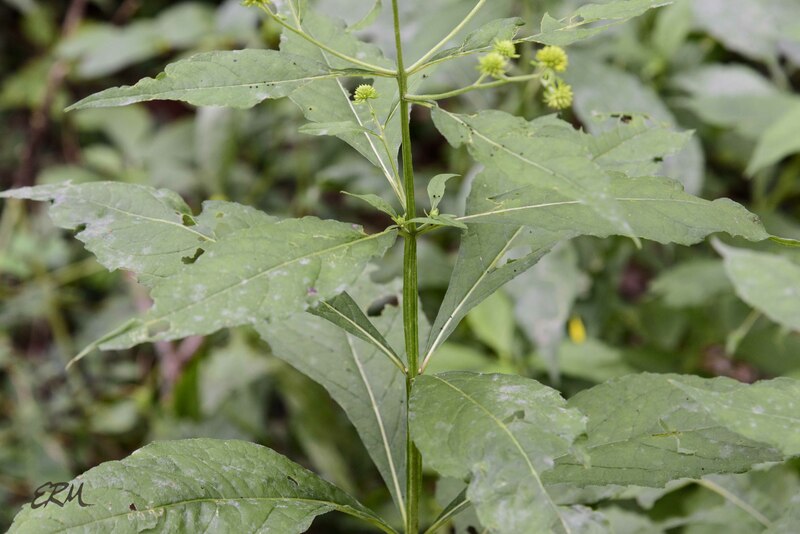 Here’s the most obvious difference: V. alternifolia leaves are mostly alternate along the stems, while the leaves of V. occidentalis are mostly in pairs along the stems. Note my frequent use of the word “mostly”. There is a lot of morphological variation in these species. 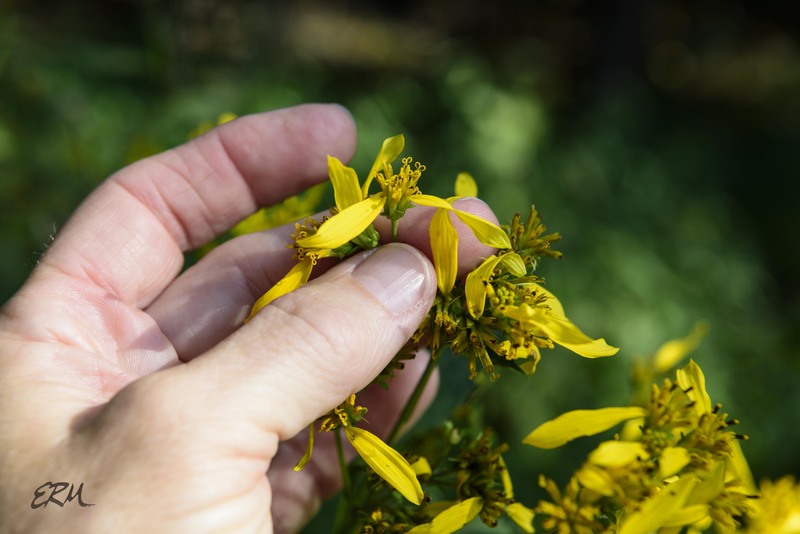 In general – and this applies to Symphyotrichum, Helianthus and many other aster family species as well – the leaves tend to get smaller as they ascend the stem, and they start to alternate at the top. You need to consider the entire plant – observe the leaf arrangement at every node, especially lower on the plant – in order to decide what the overall arrangement is. Speaking of morphological variation, have a look at this. 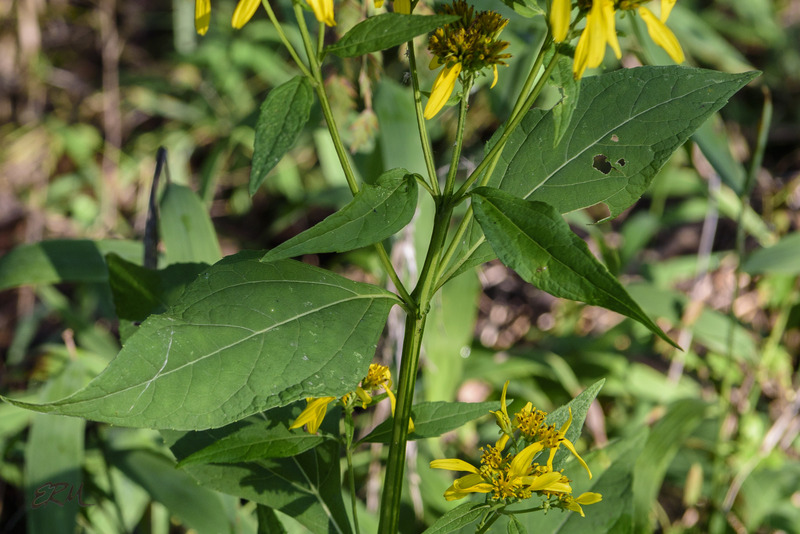 The flowers say wingstem, but how about those whorled leaves? I’m not sure what to think. This one plant was found in an area where both species were growing. Could it be a hybrid? Now look at the flowers. V. alternifolia often has fewer heads per array than V. occidentalis. However, this should not be considered an identifying characteristic, especially since it’s hard to define exactly what constitutes an array. And, V. alternifolia might have a larger number of arrays (instead of the single one pictured here). Look at the individual heads. 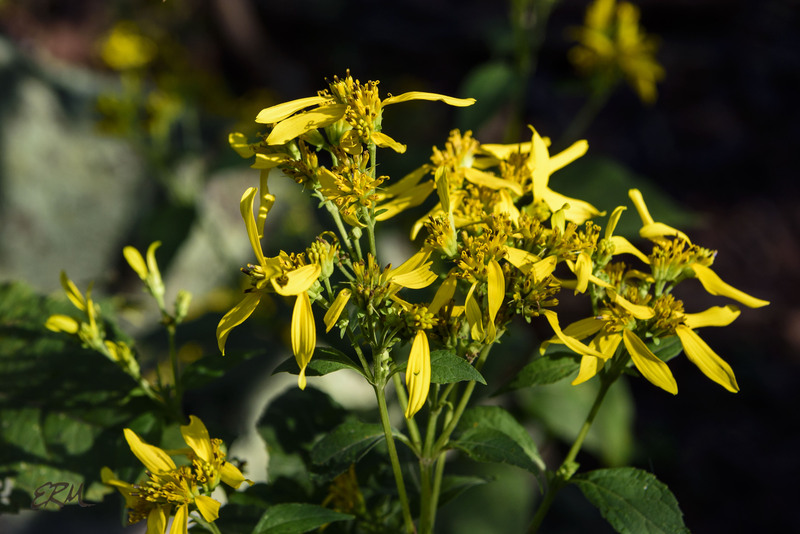 V. alternifolia has more ray florets, generally about six; V. occidentalis has one to three. Also, it seems to me that the rays of V. alternifolia are straight and often reflexed, but the rays of V. occidentalis are somewhat twisted and stick straight out. These two species grow in the same habitats. 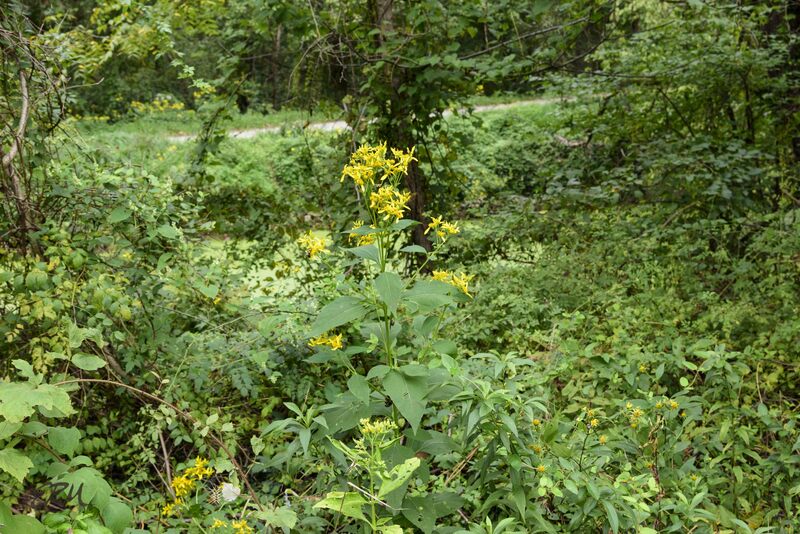 I find them on moist soils at the margins of the woods, the river, the canal, and roadways. 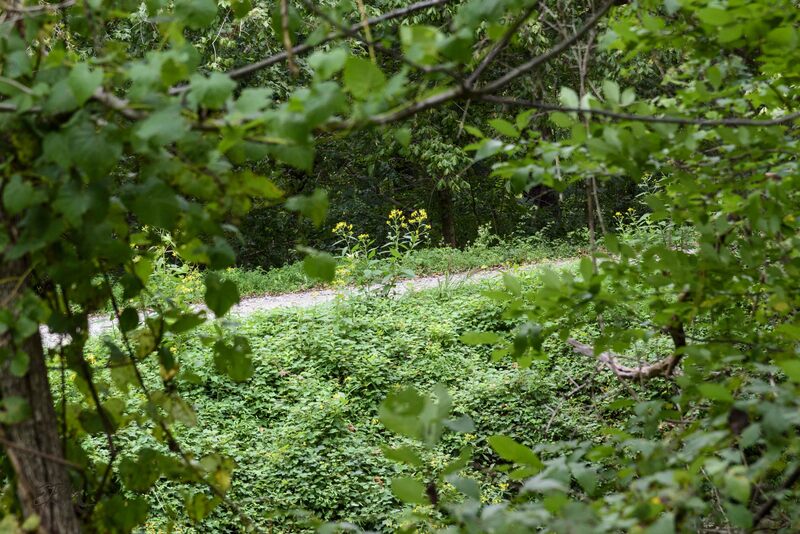 If you want to get a really good look at them side by side, take a trip to the C&O Canal Lock 6 parking lot on the Clara Barton Parkway. Right between the lawn and the trees, you can find both. You can also find two other closely related astery things, but that’s the subject of my next post. 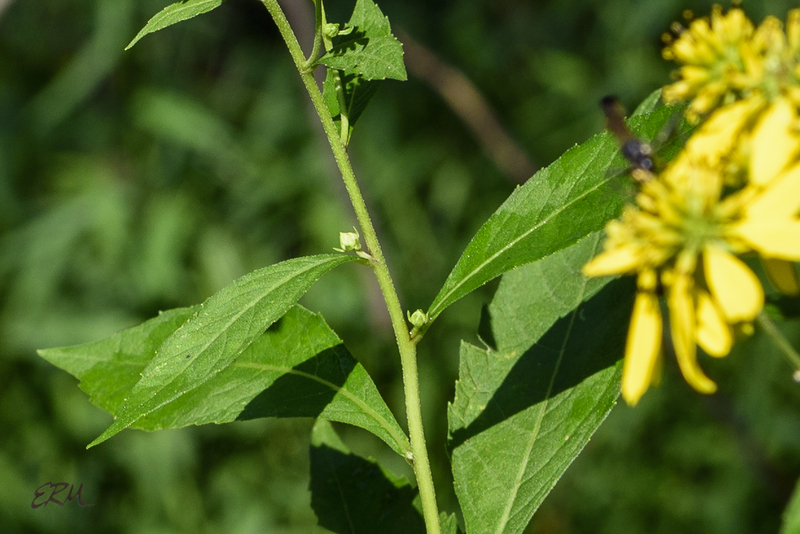 Now, about my claim that these are the only two Verbesina species present in Maryland… BONAP and USDA PLANTS both show two other species present, but neither source gives county-level data. Look at the BONAP map for V. virginica. It doesn’t look like this species would be present here in Maryland, does it? If it is, it’s on the lower Eastern Shore. 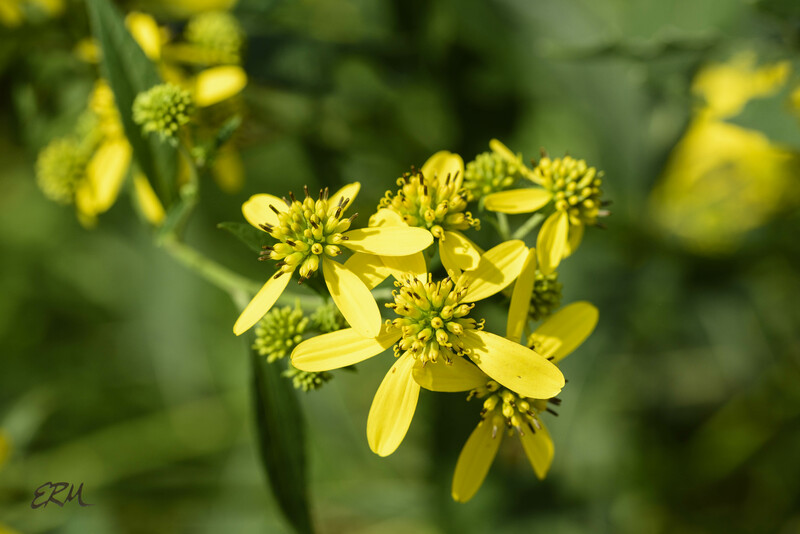 The Maryland Biodiversity Project has no records for it, though, and classifies the other species (V. encelioides) a waif, with only four records, all in Baltimore city. 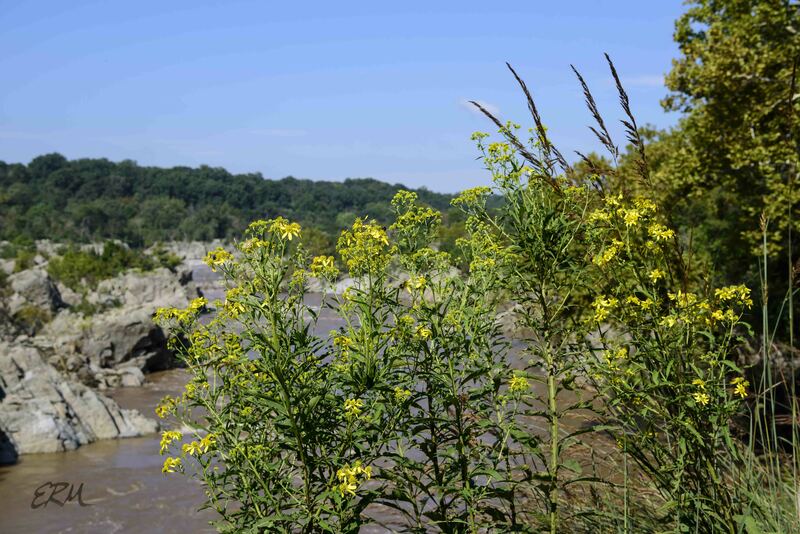 ps the top photo shows wingstem blooming above the Potomac River near Great Falls. 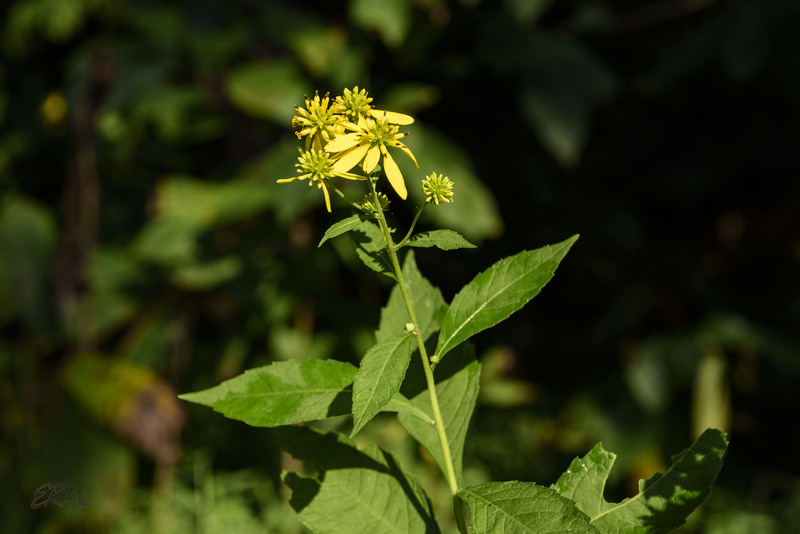 This entry was posted in Uncategorized and tagged Asteraceae, plant ID, Verbesina, wingstem by elizabeth. Bookmark the permalink. Could it be a specie that has not been documented? It might have been more obscure in the past, and suddenly became more prolific.